Balder and Morten have arrived! Hurrah. The idea to invite two creative and talented PhD fellows from the Copenhagen Business School (CBS) to teach at Sauder emerged last spring during my 2month stay at CBS. Balder Onarheim (a industrial designer on the left below) and Morten de Friis-Olivarius (a neuroscientist on the right below) seemed to me to be a wonderful combination to offer up to the Sauder MBAs interested in pursuing creative business thinking. As a result, we have a class of 21 MBAs filled up the little d.studio. 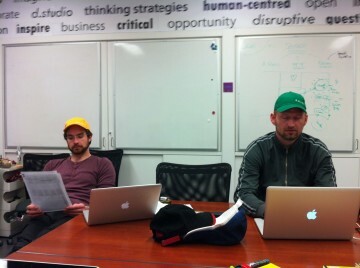 Photo below of Balder wearing the yellow positive thinking hat and and Morten sporting the green creative thinking hat. Morten’s message is all about the creative brain: the concept of creativity and how it is tested, basics on how the brain works, cognitive inhibition and fixation, and creativity and psycho-pathology. He talked about the 4P model of creativity (Rhodes, 1961; Mooney, 1963) which has process, person, press and product intersecting. Morten and Balder define creativity as something both “original” and “useful”. Morten’s session went on to unfold various theories of creativity and research work that has unfolded over the past decades including Mednick’s “associative model” and the Remote Associates Test, e.g. What word is related to these three words? PAINT. DOLL. CAT. Solution is “house”. There is also an Alternative Uses Test. One of the many interesting and useful points that Morten made was around the idea: “It’s when we forget, that we remember”. The concept of incubation (remembering or good ideas can occur whenever inhibition decreases — and clearly inhibition is an automatic process in our brains to prevent info overload) Which may explain why original and useful ideas are hard to come by when we are all overloaded by too much information. Morten finished off the session with some discussion about creativity and psychopathology. Stay tuned for Week 2.